SINGAPORE - Celebrity hairstylist David Gan has jumped into the fray and commented on the quarrel between actresses Hong Huifang and Pan Lingling, appearing to take the side of Pan. The two actresses, who have known each other for more than 20 years, made the headlines last week after Hong broke off their friendship via a lengthy WhatsApp message that was sent to 50 of their mutual friends. Over the weekend, Gan posted a picture of Pan on Instagram and referred to the spat. He said: " I've known you since the 90s and she has always been very traditional and altho some might find her old fashion, I on the other hand know her well enough and always find her naivety and very endearing. "Poor mummy. You should definitely continue to believe in yourself and if you think it is wrong then stand by it no matter what k? I'll be here for you dear friend! Jia you!" Gan could not be immediately reached for comment. Instagram stories disappear after 24 hours but netizens have captured screenshots of Gan's post and shared it. 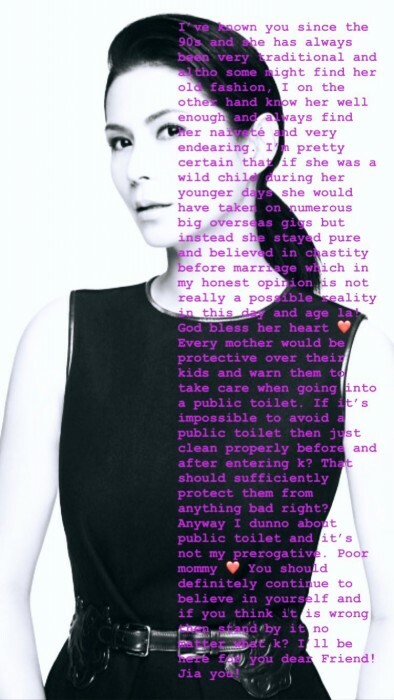 In a follow up Instagram post dated Sunday (July 29), Gan wrote: "Just to clarify, everyone can interpret my post anyway they want but all I'm saying is as a Mother you would always be concerned for your child." Unhappiness had apparently been brewing between the two actresses but the last straw allegedly came when Pan allegedly made some comments about Hong's children with fellow actor Zheng Geping - daughter Tay Ying, 22, and son Calvert Tay, 18 - at a birthday party about a month ago. Pan was alleged to have passed comments about Calvert's rumoured relationship and suggested he get inoculated against sexually transmitted diseases. At the time, he was rumoured to be dating actress Julie Tan, 25. Tan then posted an angry rant in an Instagram story that appeared to be directed at Pan. She wrote: "To the one talking s*** about me, you know what, f*** you. I used to respect you cause you're a qianbei (Chinese for senior), but now sorry lost all respect." Pan has since apologised to Tan's mother for slandering her daughter, according to Chinese-language daily Lianhe Wanbao. In an interview with Lianhe Wanbao, Hong, 58, had said that she never expected the news to go public, and had only wanted to tell their mutual friends about it so that "they know what is going on". She said the falling out is "not a war, so there is no winner or loser". Pan, 49, told the newspaper that Hong "will always be my senior", but that she will not comment further in case her words continue to hurt people.